By watching this video I noticed that in Iran most fast food restaurants use fresh beef and vegetables. In Iran they also provide other parts of the cow that western fast food places don’t such as brain, heart and liver just to name a few. If I ever get the chance to go down to Iran I plan on eating at every single place they listed. The hand knotted carpets of the area are characterized by consistency of design and quality. They always have a ground of the Mahi or Herati design (the town of Herat lies some 300 km north-east in Afghanistan) on a cream background and sometimes there will be a circular medallion. The predominant colors are ivory, blue, red and brown. The warps and wefts are cotton, the pile wool. The borders are a version of the traditional Persian turtle border. All sizes are produced. The area is exceptional for regularly weaving square carpets of 2 m x 2 m—only Moud, Kerman and Abadeh make this size frequently. Because of their extreme regularity, Moud carpets are frequently copied in India. Other weaving centers which come within the general category of Birjand are Khorasan, Kashmar, Sazevar and Semnan. Heriz is a small town east of Tabriz in the province of east Azerbaijan (NW Iran). The area is Turkish-speaking, and the villages with their mud walls and flat roofs on which hay is stacked resemble Turkish villages. Agriculturally the area is poor, though the altitude makes sheep rearing profitable. The best Iranian wool is produced from mountain sheep. Heriz are hand knotted on a vertical loom using a cotton warp and weft. The warp and weft are of very strong cotton and the pile is of Maku wool. Heriz rugs have been exported since the nineteenth century. Warps and wefts are cotton, with a woolen pile, and through the weave is coarse, the carpets are solid and hardwearing. Predominantly larger sizes are made. The Designs are always geometrical, with large blocks of color and heavy outlining. The principle colors used are browns and reds. The most common design is a version of the Tabriz medallion, with all the curves reduced to straight lines. The craftsmen of Heriz, in fact, do not know how to weave in curvilinear patterns and transform the arabesques of the patterns into perpendicular, horizontal and diagonal lines. So two different kinds of carpets can result in the same design. The Tabriz carpet will be classic and sophisticated, while the Heriz will be simple and stylized. A more curvilinear type of Heriz carpet is made in the town of Ahar to the north. 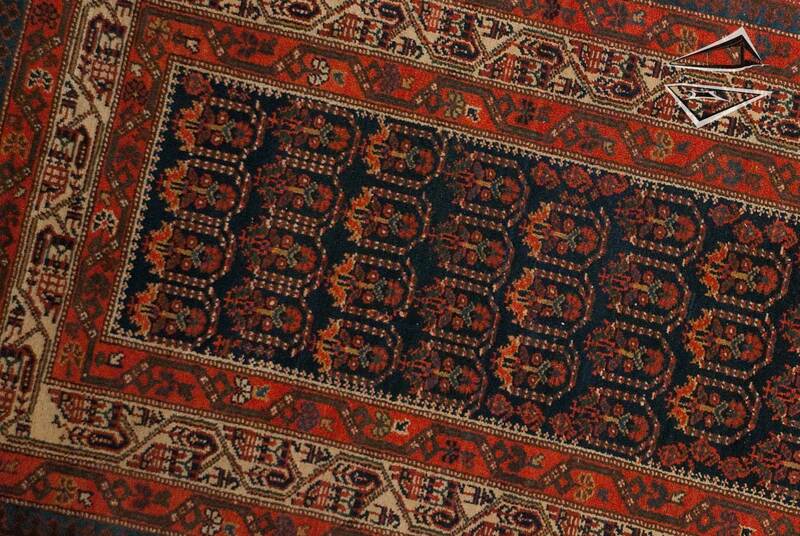 Other villages in the area important for carpet production are Sarab, to the southwest, which produces runners in a geometric design, and Kakadja, whose rugs are generally single wafted, use more, colors and have more intricate designs than Heriz. Carpets from Heriz have much in common with those from Tabriz, in particular the use of the Turkish knot, the schemes are also the same but the village craftsmen of Heriz interpret them in a very different way. Because of their durability and reasonable price, the better quality Heriz – particularly those made in the town itself and, to a lesser degree, those from Ahar – are fair investments. The growing scarcity of authentic Persian village and tribal items may lead to all Heriz becoming more collectable in the future. Here’s some examples of Heriz carpet that we carrry in our store. Ardebils are hand knotted on a vertical loom with a warp and weft usually in cotton but sometimes in wool. The quality of wool used for the pile of Ardebil carpets is rather thick. The woolen pile is of medium depth and the weave is a Turkish knot with a density varying from 60 to 120 knots per square inch. The most commonly found dimensions are approximately 4’6” x 7’0” and 5’0” x 7’6”. The name Ardebil is associated with the magnificent sixteenth century specimens such as the one exhibited at the Victoria and Albert Museum in London. These were the first of the floral-type carpets made to the order of the Safavid court during the reign of Shah Tahmasp. Recent Ardebils have nothing in common with these antique specimens. They are carpets with geometric motifs clearly inspired by Caucasian designs. The most popular compositions are based around central medallions, pole medallions and repeating octagonal forms. The rest of the field is completely covered with very varied Caucasian motifs: rosettes, stars, animals and humans and geometric shapes. The borders are usually elaborate and are often made up of a central band framed by a series of guards. The guards are decorated with rosettes and octagonal stars as well as a series of other geometric shapes. The field is usually ivory and the dyes used for the motifs are very vivid, with a lot of reds and pea greens. Ardebils are very similar in both appearance and construction to carpets made by a number of other groups in the region – the name is sometimes used rather more collectively than it should – but items produced in the village can often be distinguished by their use of an ivory field with green or lime-ochre elements in the design. Ardebils are produced in most sizes, and are often boldly attractive and reasonably hardwearing. These rugs are anywhere from 80 to over 100 years old. Stunning examples being, Saroughs and Kashans from Iran, Kazaks and Tekkes from Russia. Many other carpet making centers are represented as well. The purchase of an antique rug is an assured investment, as the carpet will undoubtedly appreciate in value over time. These pieces are proof that rugs have a timeless beauty that can be enjoyed for generations. The reputation of carpets made in the central Persian city of Kashan was so high that, according to Persian folklore, it was considered a compliment to say that a person came from Kashan, for this implied that they possessed quality and style. After the Court period which culminated with the reign of Shah Abbas. Carpet making in Kashan was interrupted for more than two centuries between the Afghan invasion in 1722 and the end of the nineteenth century. It was only during the last quarter of the nineteenth century that some textile mill owners, finding themselves in difficulties because of competition with imported textiles, decided to try launching the carpet-making trade again. The first examples woven after this renewed beginning of trade are noticeable for the magnificent quality of the wool, which makes the carpets extremely velvety. It would appear that these examples were made with wool imported from Australia and which was used for making very highly priced materials. These carpets are known as Kashan Motashemi, probably from the name of one of the first craftsmen. In a few years, because of the very high quality of the wool, the very fine weaving and the beautiful colours and designs, Kashans came to be classified among the finest of the Persian carpets. Modern production has also kept up a high level and has maintained the world prestige of these carpets. Kashans are easily recognizable by their design. The field is almost always decorated by a central medallion, which terminates at the upper and lower ends in flowering coronets. The rest of the field is closely decorated with flowers and vine tendrils. In the four quarters a richly decorated band outlines a motif, which recalls the designs and colours of the central medallion. Kashans without a medallion are much rarer. These have a floral design accompanied by a decoration including animals such as the giraffe and peacock. The border is made up of two or four guards flanking the central one, which is always decorated with a herati border motif, while the guards have the usual decoration of rosettes and a garland. Another common type of Kashan is that with figural decoration – story carpets – which are almost always in silk. The usual background colours for Kashan carpets are rich red and dark blue. Very often the carpets with a dark blue background have medallion and border in red, and vice versa. Ivory, yellow, ochre, burnt orange and occasionally green are also employed in Kashans. A recent kind of Kashan, the pange- rangh (five colours) is, as its name implies, knotted entirely in wools dyed in five colours. The background is generally ivory and the other colours are various shades of beige, gray and light blue. The pange-rangh also has a new decoration, which consists of a geometric interpretation of the classic motifs of this area. With their soft bluish grays, these pange-rangh Kashans were specifically designed for the Western market. A good quality Kashan, whether wool or silk, is generally considered a very sound investment, the price range for these glorious carpets are usually medium to high. The village of Meymeh lies about 75 miles north of Isfahan in central Iran. Joshagan is the town neighbouring Meymeh, and here they have produced rugs and carpets of some reputation for several centuries in a characteristic design that continues today. Although rugs and carpets from Meymeh and Joshagan are very similar in design and construction, Meymeh is regarded in the trade to be the finer quality. Typical examples have a tight double weft construction with cotton warps and wefts, whilst the Persian knot is used with excellent quality wool to produce a medium length luxurious pile. Meymeh rugs are easily recognizable because they are only rarely being copied by Indian carpet weavers and also due to the fact that there is little variability with designs and colors. Meymeh, Joshaghan and Khosrowabad carpets represent a group of provenances with very similar designs and colors, being differenciated basically by their level of fineness only. The typical pattern consists of little symmetrical stylized orchids surrounding a stylized medallion in the middle of which you will again find a flower cross. The border usually shows a geometrically stylized Mahi/Herati design. This design altogether is called “Jangali” which means “from the jungle”, the reason for which being that orchids are a typical flower of the jungle. Meymeh rugs are woven with the Persian knot as opposed to the more widespread Turkish knot. Meymehs are extremely distinctive in design and conservative in their use of colours. Usually the field is red with secondary colours of blue, green, and yellow. The design is made up of a theme of diamonds with a floral motif overlaid; indeed there is a fragment of an Eighteenth Century example in the Victoria and Albert Museum in London with exactly the same motifs. The Turkoman art of knotting grew out of the practical necessities of a nomadic way of life appears to be a convincing hypothesis. Mobility was an important requirement of this lifestyle and all the nomad’s personal property had to be, as far as possible. Light, easily transportable and made from readily available raw materials, the most important of which was the wool from their own flocks of sheep. Piled carpets provided protection from the cold underfoot – in these climates, freezing temperatures seep up from the ground at night – and could also he used as covers and blankets. They are generally very soft and lush and very similar to one another, and very distinguishable from other Persian rugs. The patterns are normally all-over , known as ‘guls’, repeated in straight lines on the field, with the most popular color being a rich burgundy, exclusive to the Turkomans. These guls vary from one tribe to the other, and also appear in the Bokhara pattern of Kashmir where they are often called the ‘lucky elephant’s foot’. Background colors can also be found in navy blue, black or a series of beiges. These are sometimes referred to as Caucasian carpets. Turkoman rugs have small, repeating geometric designs and are normally fine quality. The elephant foot and octagonal ‘gul’ motifs tend to look best in smaller sizes that make the most of the intricate pattern. Oriental Rugs Turkoman rugs are not the hardest wearing rugs. Oriental Turkoman rugs are recommended more for decorative use than high traffic areas. Turkoman rugs usually come in greens, reds, whites, and browns. You’ll hear Turkoman rugs referred to as Beshir rugs, Bokhara rugs, or Samarkand rugs. The dying methods used are very similar to those employed by other global weavers and artisans. The use of vegetables, bark, roots and other natural items to make dyes has been a well known art for many thousands of years. Madder root, indigo, St. John’s wort, onion, saffron, sumac, chamomile, rhubarb, turmeric, sage, poppy, buckthorn, quince, almond, walnut, chestnut and henna are just a few of the long list of natural dye sources, with madder and indigo perhaps the most commonly used. To this already complicated brew yet another ingredient is usually added, namely a fixative, a bonding agent known as “mordant”. It is applied to the wool before, often during, and occasionally after dyeing. Known as mordanting, this process has its ancient roots in China and India, reportedly passing to Europe via Persia and Turkey. Hamadan is the capital city of Hamadan Province in Iran, in 2006 the population was 473,149. Hamadan is believed to be one of the oldest standing cities in the world, many think it was possible that it was inhabited by the Assyrians in 1100 BCE. Hamadan is home to many poets and cultural celebrities, it is also said to be among the world’s oldest continuously inhabited cities. Hamadan’s culture is well known for their handcrafted leathers, ceramics and carpets. Hamadan carpets are usually a thicker heavier pile with a center medallion, and usually a traditional or tribal/nomadic design.